Mirroring a Censored WordPress Blog. The guide has been written by Sami Ben Gharbia  (Global Voices Advocacy Director), with Rebekah Heacock  (a research assistant for the OpenNet Initiative ) and Jeremy Clarke  (Global Voices web developer and WordPress designer), and translated by our friend, blogger Anna Guèye . This guide is for bloggers with self-hosted* WordPress blogs who believe their sites may be blocked by government filters. Its goal is to help bloggers use a mirror site to make censored content available to readers despite these filters. It contains step-by-step instructions for setting up a mirror for an original (”source”) WordPress blog. When it comes to accessing banned web sites and blogs, most online free speech advocates focus on bypassing censorship using circumvention tools. While this is important, teaching Internet users how to evade censorship is not enough. Many people are not aware of or do not have access to circumvention tools, as countries that filter the Internet also tend to block proxy servers and other circumvention technologies. When circumvention tools are used, they often affect connection speeds, making Internet access even slower in places where connectivity is already poor. To make your content accessible you cannot simply rely on circumvention technologies or the technical knowledge of your readers*. Taking your users’ needs into account and keeping ahead of the blocking efforts of their governments are the first steps toward implementing creative workarounds that make your site's content available to all potential readers, regardless of where they live. One way to increase access to blocked sites for Internet users in countries that filter online content is through mirroring: duplicating a site's content on another domain name or subdomain. Mirror sites automatically reflect any changes made to the original site, allowing blog authors to get around censorship by providing multiple locations where readers can access their content. 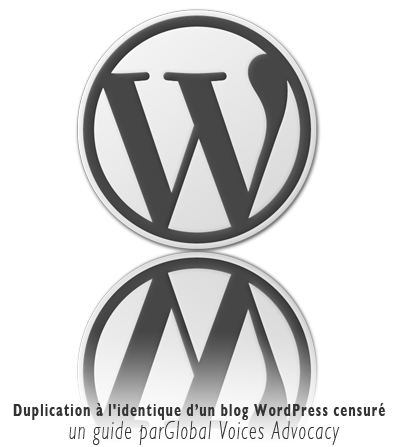 Mirroring a Censored WordPress Blog is availble for download  as a PDF file. You may need to install the free Adobe Acrobat Reader  to view it. Please download  the guide and help us translating it in your language. For further information please contact Global Voices Advocacy Director Sami Ben Gharbia at advocacy [ at ] globalvoicesonline [ dot ] org. * A self-hosted WordPress blog is one that is not hosted on the WordPress.com  free blogging service, but rather on a separate server using the WordPress.org  publishing platform. For more information, see wordpress.org .